The video for Paul McCartney‘s recent single “Come On to Me” — featuring a department store security guard named Fred Maxwell who enthusiastically sings and dances his way through the tune — has been followed by a pair of similar videos, featuring two different people.One of the videos features a young man named Ali Almohri, whose parents emigrated to the U.S. from Syria and who works in his family’s food truck. In the clip, after serving a sandwich to an attractive female customer late one night, Ali turns on the radio and McCartney’s song begins to play. Ali immediately starts singing and dancing to the tune, as the food truck bobs to his movements.The young man is so caught up in the tune, he doesn’t notice that the woman returned to his counter to tell him he forgot the onions she requested.The other video features a woman named Elsa Morales, a mother of three who works nights as an office cleaner. When the clip begins, Elsa is vacuuming an empty floor in a high-rise corporate building. She turns on a stereo on the floor, and “Come On to Me” starts playing, prompting her to dance around the office and sing.Elsa ends up dancing on a long table in a conference room, and doesn’t initially notice a window washer on a suspended scaffold who’s watching her impromptu performance.All three “Come On to Me” videos were directed by TG Herrington. 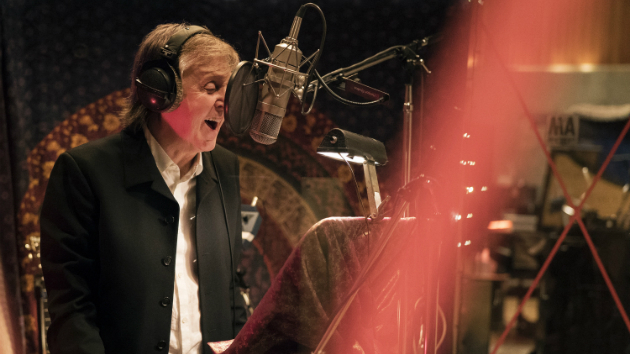 As previously reported, McCartney has launched a contest asking fans to submit their own videos featuring them doing their best dance moves along to “Come On to Me.”The videos should be posted to Instagram or Twitter using the hashtag #COTMChallenge. More details will be revealed about the competition soon.Copyright © 2018, ABC Radio. All rights reserved.